Are you interested in teaching English Language Abroad? Discover the unfamiliar by teaching ESL in one of Europe’s most influential modern countries, Germany. Germany has been emerging as one of the wealthiest nations in Western Europe, the desire to learn the English language is extremely high for the business world. Germany is a country filled with fascinating culture, immense history and a thriving need for English teachers. Along with a diverse landscape, Germany also boasts some of Europe’s most beautiful architecture. Surrounded in such an atmosphere, teaching in Germany is a rewarding and enriching experience. The two primary areas of English that are taught in Germany are General English or Business English, with the majority of students being adults. One of the most popular options for ESL teachers in Germany is teaching business English to adults. Having an intrinsic drive for knowledge and education along with many having international business connections, attributes to the need for English teachers in this diverse country. Many businesses require some of their employees to reach an advanced level of English speaking to maintain communication with their international clients, which translates to a highly motivated student. Those seeking to teach English in Germany typically find work towards the beginning of September or October, and then again in January. Most teaching contracts end in late June. For those looking to teach through the summer, opportunities are available at summer English language camps throughout Germany and the whole of Europe. One advantage of teaching English in Europe for Americans is that it is possible to gain a work visa for working in Germany. 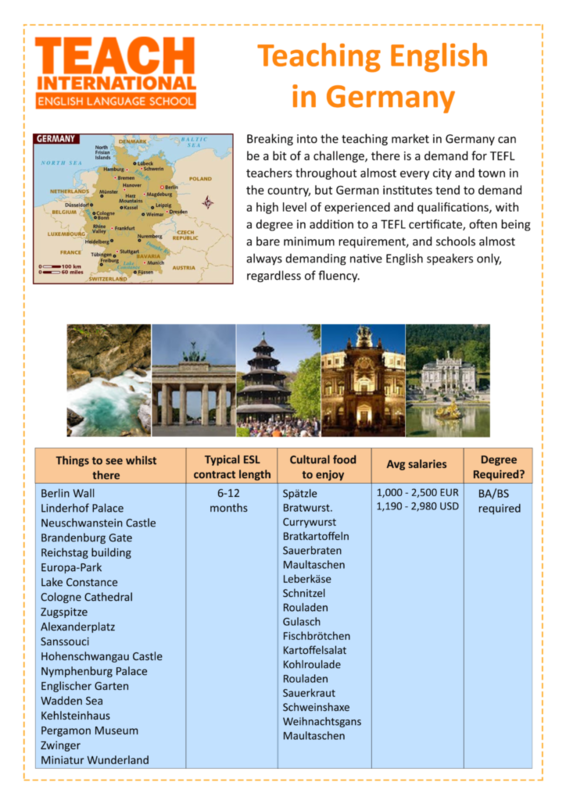 Major cities for employment opportunities teaching English in Germany include typically major cities like Berlin, Stuttgart, Frankfurt, Hamburg, Dusseldorf, and Wiesbaden. The best thing that any future English teacher in Germany can do is spend some time gathering useful information. Use the technology particularly the internet to look through job postings, apartment listings, and other online resources. The doors may not be a wide open as teaching in South East Asia Countries, but hey, teaching in Germany can still be your destiny. Check out our Country Quick Facts below for more Details.